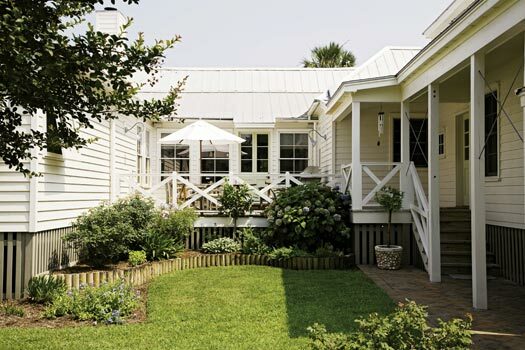 It’s not the stuff of poetry, like porches that are as fine a spot as any for a good night’s rest or well-trodden paths to the beach (though they have those, too). But it is a deal-maker, a distinction centered on good old-fashioned geography. Steadfast, sturdy walls and a swimming pool that steps off the porch are for sultry, summer days on Sullivan’s. “Here” is a couple blocks off the ocean in an early-1900s beach house she bought with her husband, Steve, eight years ago. The pair, who own local antique furniture and interiors shop Acquisitions, weren’t in the market for a rambling cottage like this one, but with two grown daughters—eldest Mary Norvell had married a few years prior, Kathleen would marry a few years later—they knew the family would be expanding and wanted a big old place where everyone could flock during summers and on holidays. And there was another big charmer: The kitchen had been recently renovated with butcher-block countertops, a soapstone sink, and a roomy island. “We knew that would be a central place for us,” says Molly, who adds that since buying the house, she’s welcomed three grandchildren to the clan (William, five; Campbell, three, and Joaquin, six months), so there’s always someone perched on the stools while she cooks. “We live around the kitchen counter,” says daughter Kathleen. 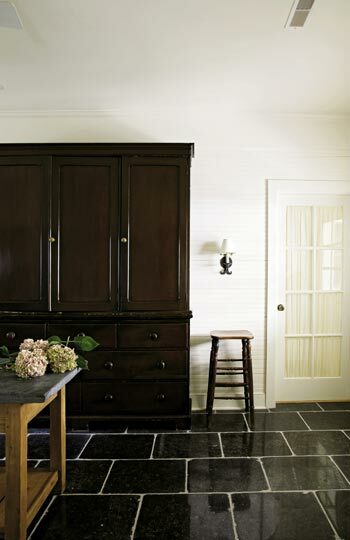 So that perfect-fit kitchen was a big plus, which meant all the Hopes had to do to ready the storybook old beach house for their growing family was add a pair of bedrooms, a mudroom (fantastic with Belgian stone tiles), a tin roof, and a pool. “That was a must from the beginning,” explains Molly. Meanwhile, livability inside is as much about chilling out as it is about cooling down. “It’s not a riot of turquoise and white just because it’s by the beach,” says Molly, but rather, a practical, handsome mix of their signature antiques, like Heriz and kilim rugs, a sycamore-top dining table, an English pine buffet, and a “triple-wide housekeeper’s cupboard made of poor man’s mahogany—in other words, somewhere, somebody painted this piece to look like mahogany,” says Molly. 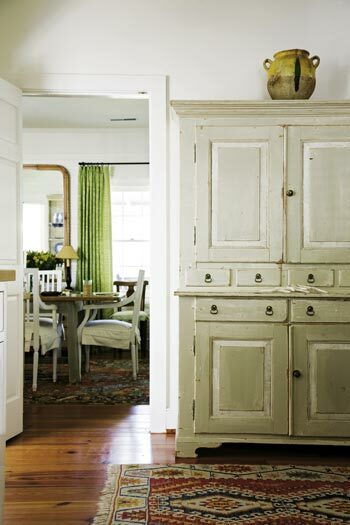 And just how do these antique gems work in a rollicking, come-as-you-are beach house? “Think about it, what’s more durable?” asks Molly. Of course it will. The trusty two-story summer home stood up to Hugo, after all, which is just more proof there’s no identity crisis here. It’s got a knack for surviving—and thriving right where it is.